Cyber-risk management is an increasingly important challenge for organizations of all kinds. Researches have emphasized the urgency for organizations to proactively manage cyber-risks and to prepare for cyber security incidents. In an increasingly punitive legal and regulatory environment, and in the face of more frequent contractual insurance requirements specifying cyber liability, forward-thinking organizations are taking proactive steps to explore and transfer cyber risk. The objective of this workshop is to bring you the next-generation security model - Before, During & After. Joseph Lee is a Technical Manager of Ingarm Micro (China) Ltd who is responsible for providing information security consultation services and formulating effective solution designs. Joseph has over 15 years working experiences in Information Technology industry. In recent years, he focuses on IT security areas including intrusion prevention system, data loss prevention, web application security, penetration test, security risk assessment, business continuity & cloud security. Joseph received his Bachelor of Engineering in Information Engineering from The Chinese University of Hong Kong & Master of Science in Information Technology from The Hong Kong Polytechnic University. He also certified as a CISA, CISM, CISSP, CEH & CPIT. There are different security requirements in healthcare environment, how exiting security solutions can be applied to meet those requirements can be a challenge. In this session, we will look at how security solutions like access control, location tracking etc. can be applied to secure information flow in healthcare environment. Leslie Sin currently serves as the System Engineer for Cisco Systems (HK) Ltd. Leslie has over 20 years of experience on networking, wireless and security solutions. Leslie holds Bachelor of Electrical Engineering, Master of Information Technology and advanced diploma in Health Informatics. Leslie is a Professional Engineer in Canada and he is CCIE, CISM, CISA, CISSP and CEH certified. Deadline for registration is 8 October 2015. Please email your full name, email, phone number,occupation and company name to info@ehealth.org.hk with email subject as Seminar RSVP for a confirmation. 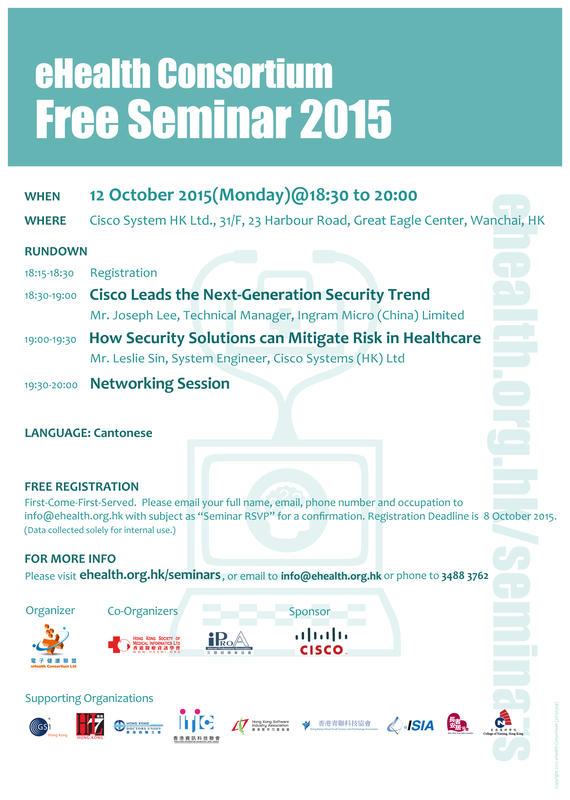 (Updated on 9 September 2015) Stay tuned for information on our next seminar!